Okay, so it's obvious, but one of these is a coffee mug. Who thinks these things up?? Not being familiar with Canon cameras at all, I guess that the coffee mug is the one on the left. Mainly because the top of the right one looks like a lens cap. I won't cry if you tell me I'm wrong - LOL!! Ginnie Hart: They actually BOTH have lens caps on, Sheila. Does that change your decision at all? Very funny Ginnie! I needed that laugh after dealing night after night with the dang campaign. I love America, can't really imagine ever leaving her, but you're not missing a thing by not being here for this toxic atmosphere. Why can't Google just go and take over Congress? They'd do it right! Ginnie Hart: HA! I actually like yours better than mine, believe it or not. But only the coffee mug! I think someone is laughing all the way to the bank. That's pretty -cool- ... or should I saw -hot- cause one's a coffee cup? Ginnie Hart: Exactly, Jacquelyn. Thanks. Pretty cool. Enjoy your coffe Ginnie! Ginnie Hart: Astrid usaes hers (Nikon) every day, Richard, and I wash it every day. Thanks. I've looked and looked and still can't make up my mind. My gut feeling is that its the one on the left? Also I have been looking at my lenses to compare so I may be right to say its left, right? Very clever, now I want one of those...ebay! Ginnie Hart: Someone is laughing all the way to the bank on this one, Philine. Bedankt. I have never seen these before! The cup must be the one on the left....or is it the one on the right? Ginnie Hart: HAHAHA! Very clever, Bill,m isn't it. I think one could retire on such a creative invention. This is surreal, Ginnie - it has got to be the one on the left, as it is not quite as clear cut? Ginnie Hart: Surreal is a good word for this, Elisabeth. I'm not saying you're right but I'm definitely saying you're not wrong! How's that for an answer. Great idea Ginnie, thanks for showing this. I like things like this. Ginnie Hart: I just LOVE these stupid, clever inventions, Chad!!! Ginnie Hart: And to think one of them is almost good for nothing, except to drink out of! Ginnie Hart: HA! A wise man indeed, who knows what's real from the get-go. Ginnie Hart: It's fun to see how close they can come to reality, Anne, isn't it! Actually, the ones I saw today on eBay are even better than when I bought this last summer. Send a Nikon one to Chad so he cant take any more pictures Ginnie. Ginnie Hart: HAHAHAHAHA! Good one, Mick. Ginnie Hart: HA! A smart guy who knows the importance of a coffee filter! 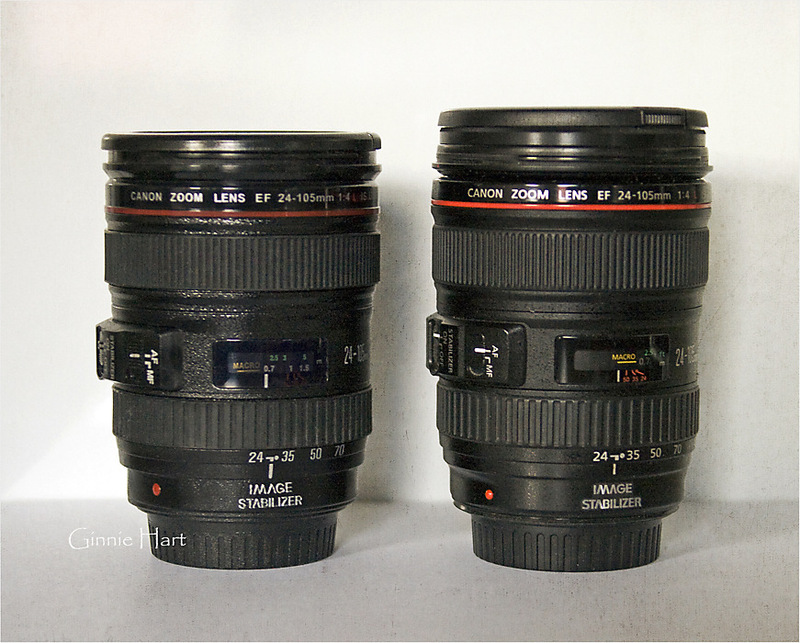 I would never buy the Canon brand of these Canon mugs (only their lenses). I was able to get mine for much cheaper off of eBay look-alikes. OK, so I'm cheap! It was too fun to resist for both me and Astrid. She drinks out of her Nikon mug every day! ahahaha...neither one fits the Nespresso machine! Ginnie Hart: HAHAHA! You are so funny, Juan Carlos! WOW...you do have to wonder about what clever and creative person thought to reincarnate a camera lens in the form of a mug. Terrific! Ginnie Hart: Someone is laughing all the way to the bank, Marcie. Speaking of which, your own mind is creative like that and one day YOU will be doing the laughing! Very nice Ginnie, I have that lens, good, but can produce a surprising amount of colour fringing for an expensive lens in some situations. Ginnie Hart: Thanks, John. I have both lenses, of course. Actually, the real lens used to be my everyday lens, which I used to love. I don't ever recall the color fringing, as you've mentioned, however. But then, you're a much more observant photographer, I'm sure! I'm guessing the one on the right. What a great idea! Ginnie Hart: I won't tell you you are right, Mary, but I will tell you you are wrong. How's that for an answer. Ginnie Hart: You can always get one, Chantal. Ha, that's a good one Ginnie! Ginnie Hart: Fun, isn't it, Doug. I'm guessing the right is the lens, but I know you're not going to confirm - you're having too much fun! Ginnie Hart: HAHAHA! You sure have me pegged, Martin. What I WILL tell you is that you are not wrong. Ginnie Hart: I thought so, too, Victoria. Amazing - what will they think of next? Ginnie Hart: Exactly! Thanks, Tom. Like a lot of people I am going for the left one Lol as the mug! really good copy which ever way round, great fun too! Ginnie Hart: Now that it's the next day, I'll point blank say you're right, Linda. Lots of fun, indeed. Thanks. it's actually pretty clever.. i wish i could've thought of it first, then raked in the moolah.. lol.. i want one! Whether Canon or Nikon, you may even find a lens you have. That was the fubn of it for me. I'll go for the left hand one Ginnie, and I hope you put all our minds at rest on Friday. I doubt whether I could get an Olympus mug to match my kit, they are too small for a decent sized drink! Ginnie Hart: Actually, Brian, I'll tell you right now that you're right (now that it's Thursday). I tried searching for an Olympus mug but couldn't find one yet. Doesn't mean they don't have one? Believe it or not, Astrid's Nikon 24-70 mug and my Canon 24-105 mug both hold the same amount: 14 oz. Not bad! i'm gonna say the left one is the coffee mug ... the right one has a lens cap! Ginnie Hart: Actually, Dennis, both of them have a lens cap. But the one on the right also has a lens filter/protector, so you're right about your choice! So fun, right?! Ginnie Hart: Now that it's Thursday...it's the one on the left, Krunal. It's fun, isn't it, to see someone's creativity like this. Ginnie Hart: It's one of those things that takes you by surprise, Cherry, as it did me when I first saw it last year. Thanks. What an inventive & original idea. I'm always stumped as to what to give my son-in-law for Christmas. This would be the perfect gift for him. Thanks so much for posting the link, Ginnie. Ha ha... The fake one even comes with a lens cap. Had a great time in Finland. Ginnie Hart: They're even better now than when I bought mine last year, LC. Amazingly realistic! Finland! You do get around. I've only been to Helsinki and LOVED it. But it was not in the winter time. You got some GORGEOUS pictures. Bravo. This is really cool Ginnie. Did you get it from Starbucks? Ginnie Hart: It's one of those things you wish you had thought of first, John, right? I was thinking of getting one. Very cool. You'll love Helsinki in snow. So much snow - endless fun. I am planning to visit Jersey. Or maybe Guernsey next month. Perhaps a little bit of Normandy too. Ginnie Hart: You are really getting around, Woman! Good for you. This is an eye-catching and impressing shot ... but I prefer the 24-70 . Ginnie Hart: Thanks, Ahmad. I actually prefer my 28-300! Who'd think of this indeed! Ginnie Hart: No handle, Wim, but you don't need one, because it's insulated. What people come up with amazes me! Ginnie Hart: You can get one easily enough, Paul. But I recommend going to eBay and getting the cheaper version which appears just as good! Without reading the comments, my guess would be the one on the right. The one on the left has a rounded rim probably to make it easier on the lips when sipping. Plus, the texture looks a little off. Hope I haven't just cast doubt on my competence as a professional. Ginnie Hart: HA! I love that you've tried to figure it out, DrAW. It's fun, isn't it. Thanks. Ok I'm wrong about the texture (probably a lighting artifact). The only giveaway I can see is the distance meter (that area where the word 'Macro' is visible). The distance between the white marking and the red markings. The distance is more on the fake one. So the real one is on the right. But I could be wrong. They did such a wonderful job! Ginnie Hart: You worked it through to a correct conclusion, DrAW. But the mugs I've seen since I bought mine last year are even more sophisticated. It's really quite amazing. Ok, with much effort since I initially saw it, it must be the one on the left. And it was only with enlarging the pic I could say. Ginnie Hart: HA! It's fun, Bob, isn't it. You're right! Funny story for you Ginnie! I got my sister a Canon 17-40L for XMas and she got one of these 24-70L coffee mugs on the damn table, she got it as a prank from her husband for xmas. So when she opened her gift from me, she thought it was another damn coffee mug! I told her just not to pour coffee in the 17-40 lens, it works better attached to a camera. Ginnie Hart: HA! I love it, Nik. Thanks for shariung this. A great idea for a shot - particularly appeals because I have one - but use it to keep my pencil/pens in - coffee in plastic mugs ain't to good. Ginnie Hart: HA! That's a great idea, George. Mine is sitting on a shelf somewhere but Astrid's has a stainless steel thermal liner and she uses hers every day for coffee. Now you've got me thinking about ways to use mine. THANK YOU.